A breast cancer survivor and mom of two, Davina ran her second multi-state run to support BCRF. Three years after she ran 470 miles from Michigan to New York to raise funds for BCRF, Davina McNaney is at it again. “I had more miles in me to inspire people to support the efforts of BCRF,” she says referring to her decision to embark on yet another long distance run for breast cancer research. Her 380-mile run, which began on June 22 in Boston, had her completing 32 miles a day for 12 days. On July 3, she crossed the same finish line as her previous run in her childhood hometown of Sodus Point, New York, but the route has changed to reflect her family’s new home in Massachusetts. “It seemed fitting to now run west. Throwing in New Hampshire, Vermont, a few mountains and the New York State Capitol made the perfect route,” she said. For Davina, running is the perfect way to combine her passion for the sport with her belief in the power of breast cancer research. “Since being diagnosed with breast cancer after my first mammogram at age 40, I have recovered wonderfully. I am strong and credit that to advancements in cancer research,” she says. Davina has always been athletic, but she has increasingly become an avid runner over the past 16 years, most recently participating in various ultra marathons. In 2015, Davina successfully ran RunMI2NY, a 470-mile, 4-state, 15-day run which raised $23,000 for BCRF. She raised an additional $5,000 in 2016 by running several 50K-100 mile races for BCRF. Since her run, she has raised more than $24,000 for BCRF. “My goal is to support research because it saves lives. Running is the avenue that helps me rally support,” she says. By running hundreds of miles across the country, Davina hopes her story will inspire others to support the cause. “Whether it's getting a mammogram, reaching out to someone dealing with cancer, donating to BCRF or facing a new challenge, I loved the positive waves that came from my 12 days on the road,” she says. To learn more about Davina McNaney’s run and how to donate visit her fundraising page. 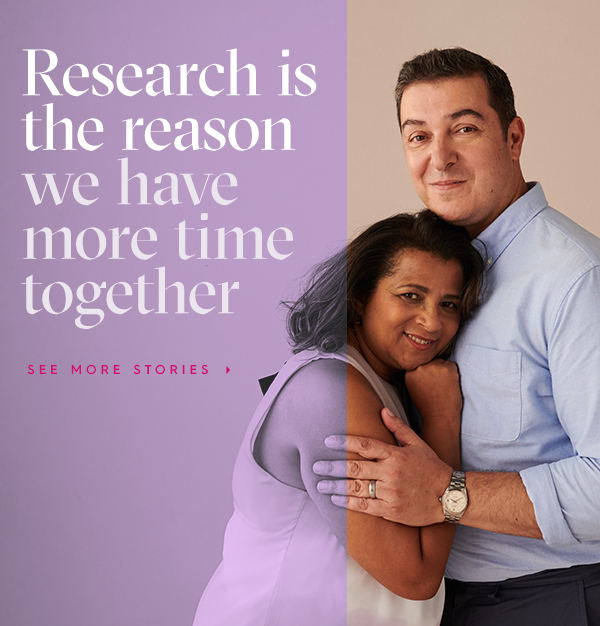 Michael and his wife share a common bond: both are breast cancer survivors. Dr. Sofia Merajver’s research has improved patients’ lives, including her own. From paying tribute to a loved one to workplace giving, there are a variety of ways to support research.